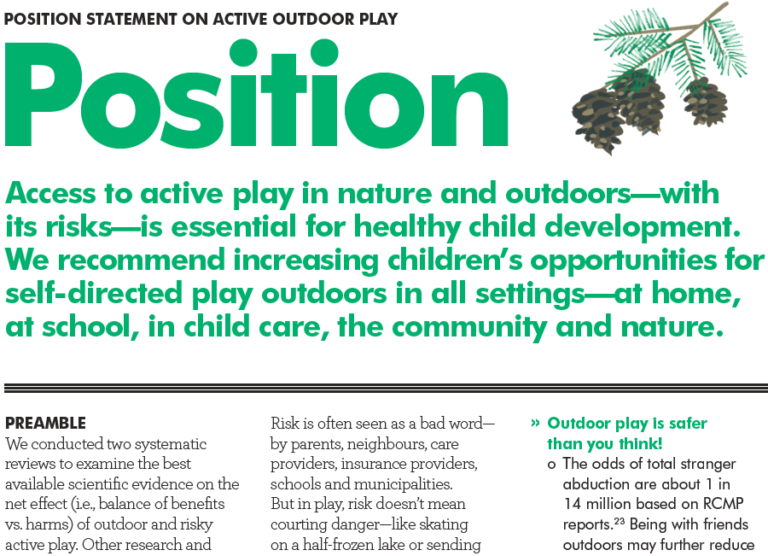 Source: CICH graphic created using a screen shot of the Position Statement on Active Outdoor Play (2015). Mark S. Tremblay, Casey Gray, Shawna Babcock, Joel Barnes, Christa Costas Bradstreet, Dawn Carr, Guylaine Chabot, Louise Choquette, David Chorney, Cam Collyer, Susan Herrington, Katherine Janson, Ian Janssen, Richard Larouche, William Pickett, Marlene Power, Ellen Beate Hansen Sandseter, Brenda Simon and Mariana Brussoni. Int. J. Environ. Res. Public Health 2015, 12(6), 6475-6505. http://stage.participaction.com/sites/default/files/downloads/Participaction-PositionStatement-ActiveOutdoorPlay.pdf – accessed May 22, 2017. The Position Statement on Active Outdoor Play was developed1 by a host of partners (see below figure) using the results of two systematic reviews2,3 that measured the net effect (balance of benefits vs harms) of outdoor and risky active play. The Statement provides information on the differences between danger and risk as well as the importance of valuing health and fun as much as safety. Throughout the Statement (targeted at girls and boys age 3 to 12) are recommendations and helpful ideas for parents, caregivers, government officials, teachers, media and a host of other stakeholders that are focused on getting children more actively engaged in outdoor play in a way that is fun and safe. To view the Position Statement on Active Outdoor Play please click here. 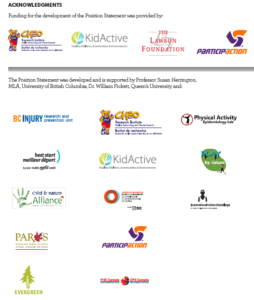 1Position Statement on Active Outdoor Play (2015). Mark S. Tremblay, Casey Gray, Shawna Babcock, Joel Barnes, Christa Costas Bradstreet, Dawn Carr, Guylaine Chabot, Louise Choquette, David Chorney, Cam Collyer, Susan Herrington, Katherine Janson, Ian Janssen, Richard Larouche, William Pickett, Marlene Power, Ellen Beate Hansen Sandseter, Brenda Simon and Mariana Brussoni. Int. J. Environ. Res. Public Health 2015, 12(6), 6475-6505.- accessed May 22, 2017. 2What Is the Relationship between Outdoor Time and Physical Activity, Sedentary Behaviour, and Physical Fitness in Children? A Systematic Review. 2015. Casey Gray, Rebecca Gibbons, Richard Larouche, Ellen Beate Hansen Sandseter, Adam Bienenstock, Mariana Brussoni, Guylaine Chabot, Susan Herrington, Ian Janssen, William Pickett, Marlene Power, Nick Stanger, Margaret Sampson and Mark S. Tremblay. Int. J. Environ. Res. Public Health 2015, 12(6), 6455-6474. 3What is the Relationship between Risky Outdoor Play and Health in Children? A Systematic Review. 2015. Mariana Brussoni, Rebecca Gibbons, Casey Gray, Takuro Ishikawa, Ellen Beate Hansen Sandseter, Adam Bienenstock, Guylaine Chabot, Pamela Fuselli, Susan Herrington, Ian Janssen, William Pickett, Marlene Power, Nick Stanger, Margaret Sampson and Mark S. Tremblay. Int. J. Environ. Res. Public Health 2015, 12(6), 6423-6454.